For deep learning beginners, choosing the right tool can help learning. There are many different tools available and it is confusing to select one at the beginning. The following diagram shows the popular tools. Tensorflow developed by Google, CNTK by Microsoft, and Theano are all libraries developed for deep learning which facilitate the back-propagation calculation using GPU. They are not hard to use, but comparing to Keras they are still very complicated. 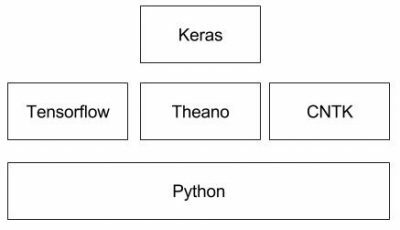 Keras is just an interface for using the underlying deep learning libraries. Using Keras is as simple as playing Lego. I suggest beginners starting with Keras. Because you can quickly get a taste of what deep learning can do and get motivated to do more interesting projects.